These are a whole new level of WHOA. All natural, healthy and sure to satisfy a sweet tooth!!! The base is a paleo banana donut and it’s topped with espresso chocolate and coconut oil and a pinch of sea salt. I have no more words. 🙂 Well, except that I got the original recipe from PaleOMG and adapted a bit. What a great site!! Go make these little nuggets -I mean – these are WHOA!!!!!!!! 5 dates, pitted – I actually didn’t have dates, so I used 2 tbs almond butter! Place bananas, honey, and dates (or almond butter) in a food processor and blend until smooth. Then add the eggs, coconut flour, oil, vanilla, cinnamon, baking soda and powder, and salt to your food processor and puree until completely combined. Grease your donut pan and pour ingredients into pan. Bake for 20-25 minutes or until completely cooked through (poke a toothpick through one to make sure it comes out clean. Once donuts are cool, melt another 1-2 tbs of coconut oil in a skillet then melt your chocolate in and mix in your ground coffee. 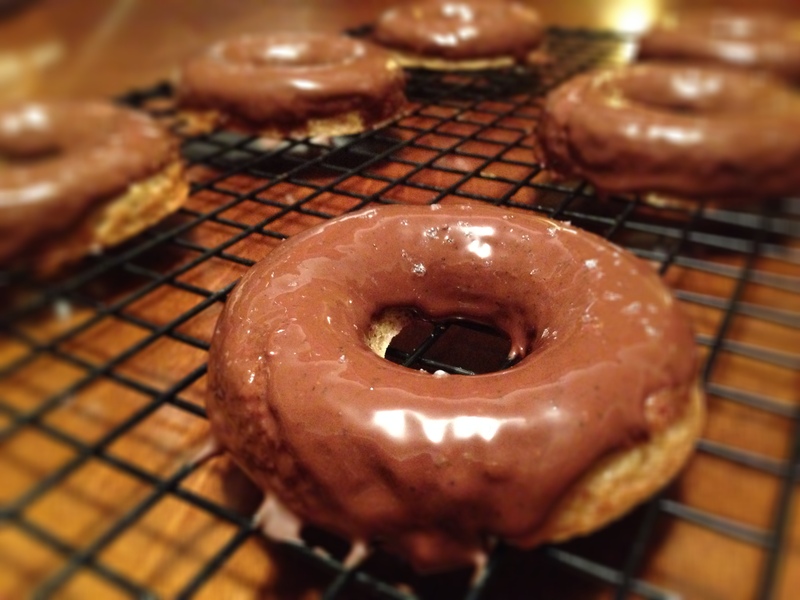 Now dip the top of your donut directly into the melted chocolate, then top with a bit of coarse sea salt.